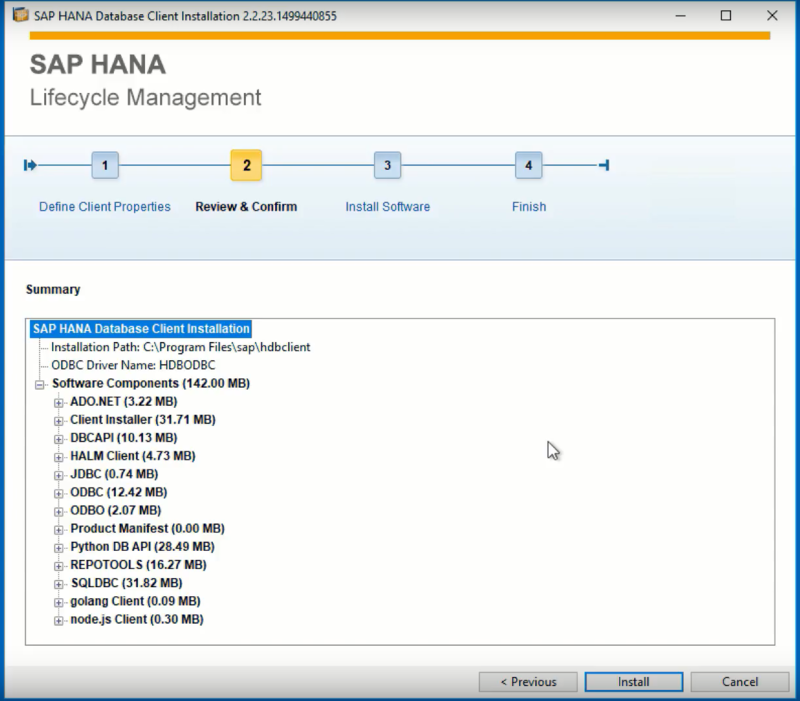 Installing or updating the SAP HANA client takes 20 seconds, if that, and is very easy to do. When using the Windows installer hdbsetup, you will have to decide whether to install or update, click Next and then click Install or Update corresponding to your first selection. When using the command line installer hdbinst, you can reduce installation anxiety even more by running the command with the -b for batch parameter and the tool will make any decision for you using the (documented) default selections. This makes it very easy, of course, to fully script the update of the SAP HANA client so this can be performed at midnight during a maintenance window on all 20, 50 or 400 client systems in your landscape. Although the task is easy, it is still important to properly prepare yourself before performing the activity. What ODBC, JDBC, ADO.NET or Python client versions are included exactly in the SAP HANA client? Which SAP HANA server releases exactly are compatible with the latest SAP HANA client? In this blog, I will provide some references and background information for the client installation and update videos of the series. For SAP HANA 1.0, it was very common to install the SAP HANA client on a workstation (Desktop) as the regi.exe executable was required to perform repository synchronizations for native development using the SAP HANA XS classic model and SAP HANA studio. This explains the support for both the rather old-fashioned 32-bit platforms and the more fashionable, but a-typical for SAP, Mac OS X platform. For SAP HANA 2.0, XS classic, the repository (regi.exe), and the SAP HANA studio are no longer in development as this platform now offers the SAP Web IDE for SAP HANA and the SAP HANA cockpit as development and administration tools, respectively. As the SAP HANA client is also frequently found on SAP Netweaver AS ABAP application servers and as this AS runs on many enterprise-class systems we also find support for IBM Power System, Oracle SPARC, and HP Itanium architectures with its corresponding operating systems. Normally, you would find technical release information about supported platforms listed in the Product Availability Matrix (PAM) on the SAP Support Portal. However, according to SAP Note 2499500, even the matrix does not have enough fields for the full range of client platforms and requirements. The SAP HANA client bundles a number of clients, some of which have been included since day one, like the ODBC, ODBO and JDBC clients for C/C++, OLAP/XMLA, and Java database connectivity, respectively, with the SQLDBC libraries, included for good measure. SQLDBC, originally, are MaxDB client libraries. Why MaxDB? Take a look at the MaxDB SQLCLI client commands and call options and compare this to ones for the SAP HANA Interactive Database Terminal (hdbsql) and you will see the origin of the species. Same for hdbuserstore and XUSER and, on the server-side, much of the persistence infrastructure of SAP HANA. The Python DB API has been included as well from the very early days, not as supported database client – this was only introduced in the latest SAP HANA 2.0 SPS 02 release – but for internal housekeeping. Python was the lingua franca of the TREX Search Engine, which technology made its way into HANA as well. Apart from Python support, SAP HANA 2.0 SPS 02 also introduced support for the Go language. Support for the Node.js client was introduced a couple of months earlier in SPS 01. Support for Microsoft ADO.NET was added in SAP HANA 1.0 SPS 08. In the SAP HANA Client Interface Programming Reference and on the SAP Community wiki, you can find some tutorials to get started with .NET programming for SAP HANA. The SAP HANA Client Installation and Update Guide documents the installation and update process, which, as mentioned, is a quick and easy one. However, there are a number of SAP Notes that add additional and important information you might want to take note about. 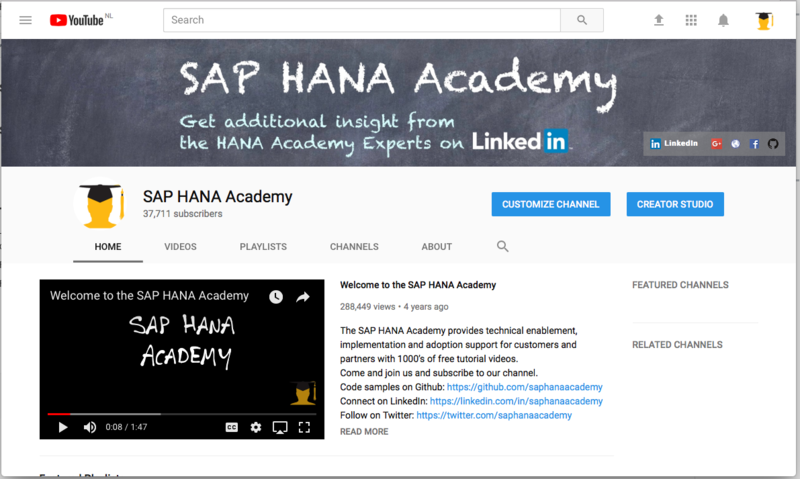 How to install the SAP HANA client is the topic of this first video. As mentioned, it only takes a couple of seconds, but in this video, we discuss what you need to know and where to find that information. We show you the easiest way to download the software, how to install using the graphical installer and how to install on the command line for batch installations (scripted). Once you have installed the SAP HANA client, you will need to update it from time to time to enjoy the latest features. In this second video tutorial, we cover downloads, scripted batch updates on Linux and one/off updates on Windows using the graphical installer. We also show you how you can unbox the client SAR file using the SAPCAR swiss army knife included for free. Currently, the only version of the SAP HANA client available for download outside of the SAP Software Download Center (requiring an SAP account) is version SAP HANA 1.0 SPS 12. It is listed on the SAP Developer Community Trials and Downloads page. This will redirect you the SAP HANA Store where the actual download is available. 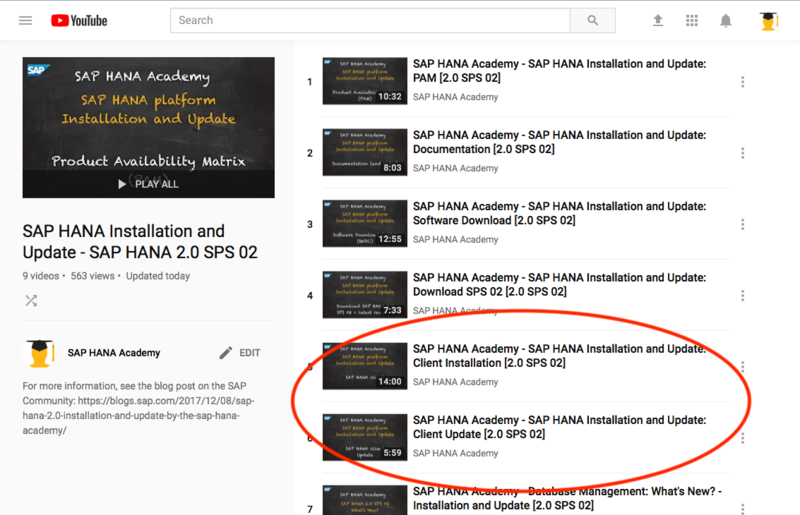 For your convenience, in case you also still need to perform SAP HANA 1.0 SPS 12 client installations and updates, below the corresponding tutorial video.